I am the first to admit that I set myself up for disappointment with every Guillermo del Toro movie I see by setting my expectations based on Pan’s Labyrinth. It would be hard to repeat such a success, and he hasn’t done so since. Nevertheless, I keep doing the same thing over and over and expecting different results. I’m not saying Crimson Peak was bad. Actually, I thought it was pretty good. But it is about half an hour too long and, contrary to Natalie Wilson’s insightful review, for me it falls prey to too many sexist tropes to live up to Pan’s Labyrinth standards. In the film, del Toro uses a horror template popularized by Victorian novels: A young woman is taken away by a suspicious new husband to an old castle far away from civilization. As she explores the winding maze of her new multiple-floor prison, she encounters a few ghosts that encourage her to uncover the truth about her husband and his sister. Gothic novelist Ann Radcliffe—best known for her trademark endings in which the supernatural happenings in her castles are explained as misconceptions fueled by fear, shadows in the moonlight and tricks of the impenetrable dark—opined on the nature of fear in this sort of story in an essay called “On the Supernatural in Poetry.” Terror, she asserted, arises from a fear of something about to happen. Horror, on the other hand, is a reaction to something that has already happened. A good Gothic story, then, uses a carefully structured build-up of terror followed by a revelation of horror to achieve its best effect. Crimson Peak calls upon both terror and horror, but fails to find the right balance between the two. Suspense, shadow and mystery should set the stage for the horrific revelation of the truth. Too much blood too soon desensitizes the audience to the suspense; if you already know what’s behind the door, you’re not as terrified for the ingenue standing in front of it. 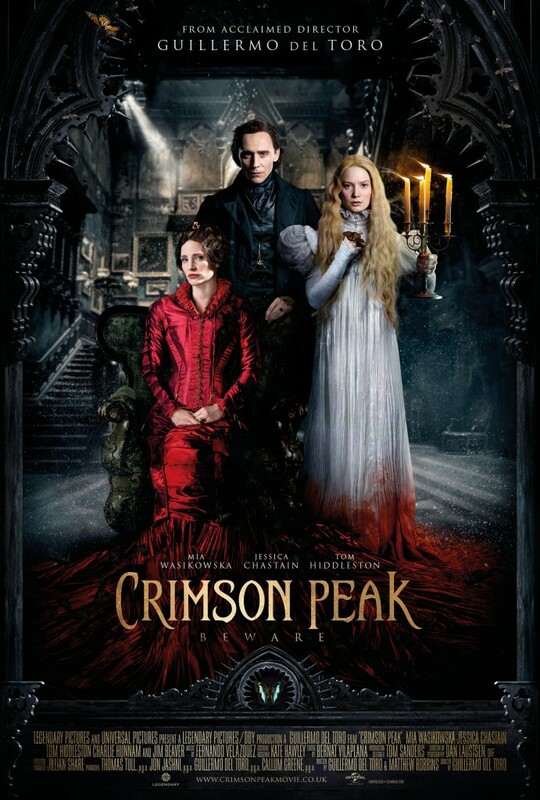 Though Crimson Peak is unable to execute the part of the Gothic template that requires suspense, it does manage to perfectly replicate the patriarchal conditions that led so many women to read and write these stories in the first place. Being separated from one’s family and friends upon marriage to a virtual stranger who transplants you to a lonely, cold, falling-down house in the middle of nowhere was not an uncommon experience for the Victorian woman. It’s no wonder that it spawned so many stories of fear. Crimson Peak‘s heroine, like so many before her, does have men willing to do anything to protect her, which is lucky for her because her primary response to stress is to dissolve into tears. But unfortunately, in addition to her untrustworthy husband, she also has an evil sister-in-law. Played by an almost unrecognizable Jessica Chastain, the crazy lady who lives in the attic is the real danger in this story. The men, it turns out, are guilty only of doing anything for love. I can’t help but wonder why del Toro felt this story would resonate today, absent the social conditions that created the fears that Gothic stories originally represented. Are scary houses and ghosts enough to make a story interesting? Or are these patriarchal conditions more alive than I like to think? I don’t suppose many brides get swept off to country castles upon marriage, but regardless of when and where, marriage requires a massive investment of trust in another person, and for some, that can be pretty scary. So if you want to see pretty cool ghosts that haunt a freaky house with scary corners and corridors, a representation of the fear of totally trusting another person in a Gothic form, and/or Tom Hiddleston, see Crimson Peak. If you want to see a horror movie that empowers its lead female to make her own choices and save her own life without the intervention of men, then let me know when you find it, because so do I.